Shortly after a video emerged showing the Saudi Ambassador to the United Nations, Abdallah al-Mouallimi, failing miserably in an effort to justify his nation’s call for elections in Syria while simultaneously refusing to agree to elections in Saudi Arabia, a new contender for “worst defense of your nation in an interview” emerged. 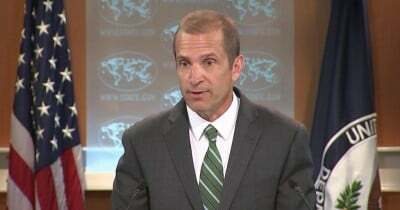 This time, the miserable fail comes from the United States and State Department Spokesman Mark Toner. In another example of what happens when a Western, GCC, or Israeli political figure is simply asked a real question and even timidly held to the fire, Toner was asked whether or not the recent victory of the Syrian Army over ISIS in Palmyra was a positive development. In fact, the question was direct; did he prefer ISIS or Assad to control Palmyra? Such a question would provoke an easy answer on the side of Assad from any reasonable person. But Toner does not represent a reasonable person or a reasonable government. He represents the U.S. State Department. Reporter: Do you want to see the regime retake Palmyra? Toner: Uh . . .
Reporter: Or do you prefer that it stay in Daesh’s hands? Reporter: You’re not answering my question. Toner: I know I’m not [laughs] Um . . . I’m giving a broader view. Uh . . . and then we can all increase our efforts to . . . uh . . . to go after Daesh and dislodge it. Toner later admitted in the press conference that Daesh was “probably” the “greater evil in this case” despite the fact that he also suggested that designation was a close call between Daesh and the “regime” of Bashar al-Assad. The very fact that Toner could not answer the question in a clear and direct fashion exposes a hard fact about American foreign policy – it is designed to destroy the secular government of Bashar al-Assad. If Toner had readily admitted that the Syrian military’s victory against ISIS was a positive development, he would have effectively admitted that the SAA is the greatest enemy of the terrorist organization bar none and eliminated his State Department’s justification for military intervention and hostility toward the Syrian President. Still, despite his actual words, Toner’s bumbling response did nothing more than to make it obvious that the United States desires to see the preponderance of terror across Syria but, because of its tangled web of phony narratives, simply cannot admit it outright.